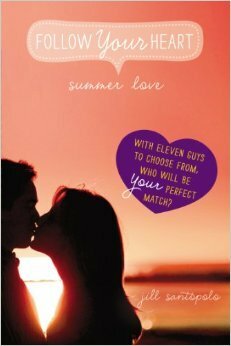 For fans of The Bachelorette, a personalized summer romance with 13 possible endings! Summer is all about relaxing and having fun. But it’s even better when you find the right guy to share it with. In this original romance, you get to choose how to find your happy ending, which can result in a kiss from one of eleven swoon-worthy guys. At the end of each chapter, you decide how to continue your journey to find love, and the endings are based entirely on the choices you make while reading. Every selection counts and the possibilities are endless. Not ready for romance? No problem! There are different endings to satisfy every reader, so you're guaranteed one fabulous beachside summer! When I was growing up, I loved "choose your own adventure books." I especially had a soft spot for the Goosebumps one. I stumbled upon Summer Love while browsing Goodreads and decided to give the younger version of me some love. Over all, Summer Love was a short and light hearted. If you enjoyed the choose your own adventures when you were younger, or know some younger individuals who enjoy them now, then I would look into this and Love on the Lifts.